Blue Jays 3 Philadelphia 0; The Good, The Bad and The Ugly. The Blue Jays opened up their wacky four game series with a nice 3-0 win, It is the Blue Jays second straight win and their record now sits at 15-17 on the season. The Jays are now in a three way tie with Tampa and Boston for third in the AL East. The Jays send Drew Hutchison to the mound tomorrow night against the Phillies Cole Hammels. The Good: J.A Happ pitched five shutout innings tonight, he did walk four and allowed three hits while striking out two, It was by no means a masterpiece but it was good enough to get the job done. Jose Reyes wacked the third pitch of the game out of the park for a lead-off home run and sparked the Jays offence which scored three runs in the first two innings. Colby Rasmus continued his hot streak going 2 for 3 and a walk, both of Rasmus’ hits were doubles. Melky Cabrera continued his hot pace getting another 2 hits, it was Melky’s 15th multi hit game of the season which leads the Major Leagues. Jose Bautista went 0 for 3 but was hit by a pitch to extend his streak of getting on base safely to 32 games on the season and his 33rd overall. The record is 84 games so Bautista has a way to go to catch that number. Bautista also showed why you shouldn’t try to run on him as he threw a laser to home plate on a Ryan Howard fly ball to deep right to nail Marlon Byrd at home plate. 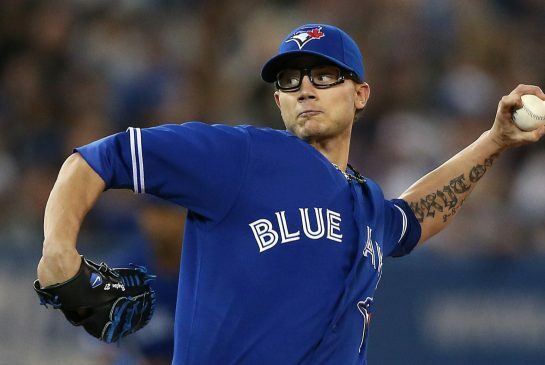 The Bullpen bent but didn’t brake tonight as Esmil Rogers and Aaron Loup tight roped out of trouble in the sixth and seventh before giving way to Steve Delabar and Brett Cecil who finished it off. For Cecil it was his second save of the season. The Bad Edwin Encarnacion went 0 for 4 tonight and is now 0 for his last 15. John Gibbons, who is dealing with a short bench kind of, let Esmil Rogers bat for himself in the top of the seventh, Rogers didn’t fair all that bad he hit a fly ball to left, but he did have a couple of good hacks during his at bat. The Ugly: Brett Lawrie left the game in the fourth inning with tightness in his right hamstring. According to Mike Wilner on the post game show says that Lawrie had said it had been bothering him for the last few days and that it’s nothing that a few days off shouldn’t take care of. Having gone thru a hamstring injury with Reyes it wouldn’t surprise me if Lawrie ends up on the DL. For the time being expect to see Juan Francisco at third base and honestly that is kind of a scary thought. Another Meltdown, Stroman Called Up. The Blue Jays had a 6-2 lead going into the seventh, and for the sixth time in the last two weeks the Blue Jays found a way to let it slip away again. Aaron Loup came on in the seventh inning with a runner on second and a four run lead. Loup would go on to allow that run to score and allow three more to cross the plate to end the seventh in a 6-6 tie. With Brett Cecil unavailable tonight, Todd Redmond came on to work the eighth and gave up a two run double to Neil Walker to give the Pirates a 8-6 lead. 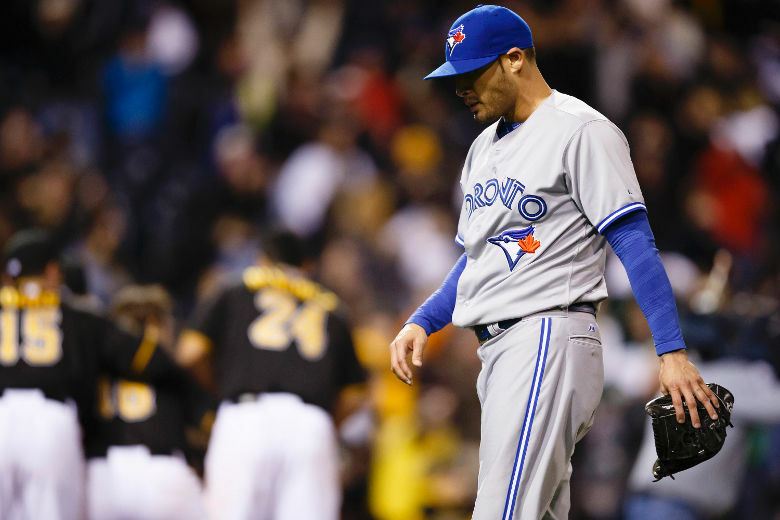 The Pirates tried as they might to let the Jays tying the game up in the ninth committing a pair of errors to put runners on the corners before Colby Rasmus would ground out to first to end the game. It’s getting to the point where no lead is safe with the Blue Jays and that they need to score 10 plus runs and hope that the pen can hang on to a lead. But at this point it’s safe to say that this is getting completely out of hand, it’s almost like clock work waiting for the bullpen to implode. A lot of fans on twitter and other message boards keep saying to Fire John Gibbons, I disagree completely, Gibby isn’t the one out there pitching, he is making the moves that he thinks is giving the Jays the best chance to win, I don’t know what more he can do at this point other than keeping a starter in the game too long. 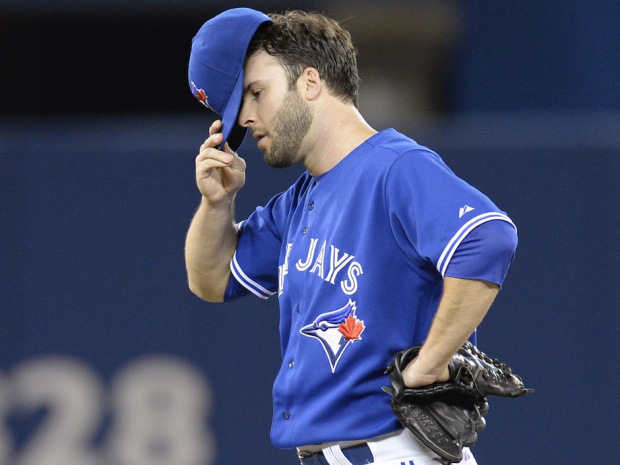 The Jays did receive more bad news on the Brandon Morrow injury. Morrow was transferred to the 60-day DL with a tendon sheath injury. The plan is to rehab the injury and if he’s not healed by July he will undergo season ending surgery. The Jays did call up Marcus Stroman after the game tonight as well, the plan is for him to pitch out of the pen. Can’t say I agree with the move, I think if they are bringing Stroman up he should be in the rotation and that Dustin McGowan should be put in the bullpen as he was there last year and has the experience pitching out of the pen. I also worry that Stroman is being set up to fail with lofty expectations by the fan base, some of which look at him as the saviour, which is just foolish. 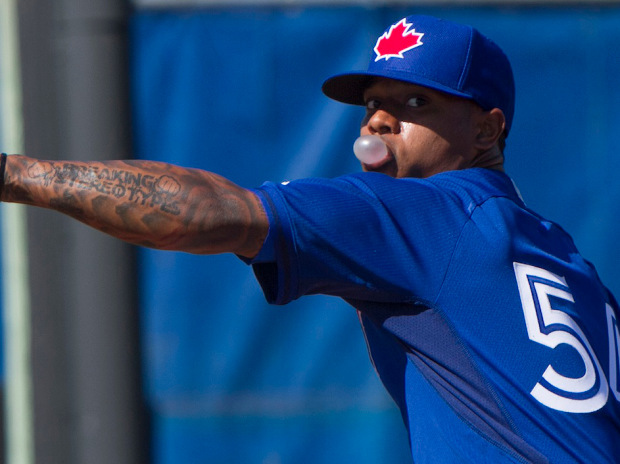 Stroman is going to go through growing pains like every other rookie out there and I just hope that the expectations haven’t been placed to high at this point. 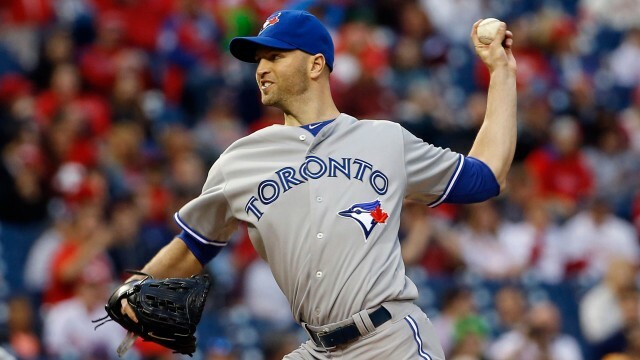 It also looks like now with Morrow’s injury news that J.A Happ will be in the rotation for the foreseeable future. Which may or may not end well, although I think it is safe to say that the Blue Jays really dropped the ball this winter by not getting another starting pitcher into the fold. Not that the starting pitching is the weakness on the team as of this moment. Santos Blows It Again, What Next For The Jays’ Pen,. For the third time this season Sergio Santos blew a save opportunity, tonight however, had to go down as the most spectacular of the three that he has blown. Santos came into the bottom of the ninth with the Blue Jays leading 5-3. He gave up a first pitch single to Neil Walker, then struck out Andrew McCutchen but then served up a fastball right down the middle of the plate to Pedro Alvarez who belted a two run blast to center. Santos then got Ike Davis to fly out and then he gave up the game winning shot to Sterling Marte to give the Pirates a 6-5 win, the win was the Pirates sixth come from behind win. As for the Blue Jays, this has become a disturbing narrative that keeps repeating itself early on this season. The Bullpen has had their struggles ever since they allowed six runs on eight walks in a game in Minnesota two weeks ago. The Jays have now let five games get away from them when the Bullpen has been handed a lead in a game. After the game tonight John Gibbons hinted at some changes with the pen in general with Gibby saying that they really miss Casey Janssen and Dustin McGowan in the back-end of the bullpen. It could be totally conceivable that Marcus Stroman gets the call to the Jays’ because the Jays really need McGowan in the pen to help Steve Delabar, Brett Cecil and Aaron Loup. I’ve thought right off the bat that the bullpen missed having McGowan in the back-end of the pen where he pitched so well last year, add to the fact that Janssen is still on the DL and Neil Wagner was sent back to Buffalo in favour of a long man, which in turn have put more pressure on the back-end guys to work more in high leverage spots. Add to it the shortage of innings out of the starting rotation early on and it’s easy to see why Gibby is really considering putting McGowan back in the pen sooner than later. As for the short-term solution, it wouldn’t surprise me if Gibby mixes and matches his relievers to get thru the back-end of a game. They could use Cecil or Delabar in spots too. How they would use Santos in games is anyone’s guess. I can’t imagine that they use him again in a save situation any time soon, so maybe they use him when a game is already out of reach. If this early stretch of struggles in the pen it has made Jays’ fans appreciate Casey Janssen much more now than perhaps they had before. The Blue Jays snapped their two game losing skid on Thursday night and salvaged the final game of their three game tilt with the Royals. With the win the Jays record now sits at 13-15 and they sit in third place in the AL East two and half games behind the Yankees. The Blue Jays travel to Pittsburgh to start a three game weekend series. 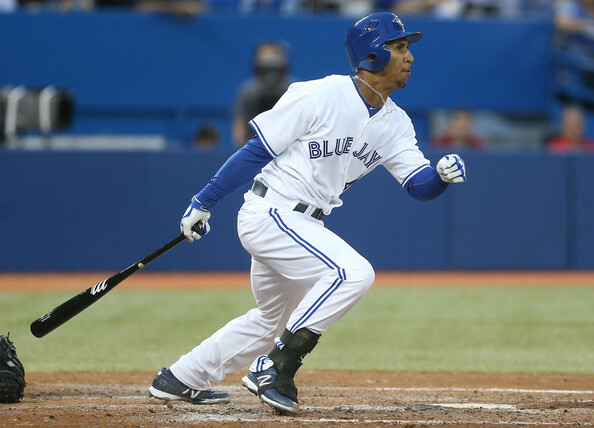 The Good Anthony Gose, who was called up on Thursday morning, accomplished more in one night than Moises Sierra, who was Designated for Assignment on Thursday morning, did in the whole month that Sierra was a Blue Jay. Gose went 2 for 4 and drove in a pair of runs, Gose also had a great game in Left Field tonight cutting down Eric Hosmer at home plate in the third inning to prevent the Royals from taking a 3-1 lead. It’s not clear how much playing time Gose is going to get but he will be valuable off the bench which is more than I can say about Sierra. Juan Francisco was 2 for 5 and hit his third home run as a Blue Jay. Colby Rasmus got his fifth home run to break a 3-3 tie in the sixth and then had a big bases loaded walk in the eight to give the Jays a two run lead at the time. Chris Getz had another impressive game going 2 for 5 along with a pair of stolen bases in the first inning. Aaron Loup was money again out of the pen going 2 2/3 perfect innings and only having to throw 22 pitches to pick up his first save of the season. Mark Buehrle who at times scuffled still pitched into the seventh to pick up his fifth win of the season, Buehrle didn’t pick up his fifth win last season until his 18th start on July 5th. The Bad Jose Reyes was 0 for 5 on the night and is hitting below 200 on the season. Reyes still looks tentative when he is out in the field after coming back from the hamstring injury, and I would imagine it’s only a matter of time before Reyes gets back on track. The Ugly Jose Bautista sometimes makes me wonder if he is daydreaming on the bases, in the first inning with Getz at Third and Bautista at second. Edwin Encarnacion hits a ball that doesn’t get out of the infield and instead of staying at second like most base runners would Bautista heads for third and is promptly thrown out at third. For the second time in less than a week Bautista has made a bone head move on the basis and sometimes I wonder if he is one of the dumbest base runners in the game when I see stupid stuff like that. The Jays had another 3 run lead evaporate today as they lost their fourth straight game and watched their record to fall to 11-13. The Jays send R.A Dickey to the mound tomorrow afternoon in an attempt to salvage the final game of their three game set with the Red Sox who send John Lackey to the mound. The Good: The offence showed up for the most part today. They got three runs in the first before an out was recorded and then came back with two runs in the eighth and then Jose Bautista hit his team leading seventh in the ninth inning to bring the Blue Jays within a run. Bautista and Dioner Navarro led the team with three hits each. Bautista also extended his streak of reaching base safely to 24 games. Melky Cabrera went 1 for 4 to extend his hit streak to nine games and leads the Majors with 37 hits. Aaron Loup, Brett Cecil, Steve Delabar and Sergio Santos were money out of the pen to keep the Jays within striking distance today. And a shout out to Blue Jays pitching coach Pete Walker for giving home plate Jeff Kellogg a piece of his mind in the top of the third over Kellogg’s horrific strike zone. It may have been one of the more subdued ejections in history though, Walker should have got his money’s worth and really got into Kellogg’s face, but he got his point across either way. The Bad: Moises Sierra had another 0’fer day going 0 for 3 and is now 2 for 27 for the season and questions are just getting louder about why he is still on the roster. I think we all know why, Alex Anthopoulos really likes those players without options and seems scared to death to lose these players, I mean why else would the Blue Jays still have an eight man bullpen. Chad Jenkins, who was making his season debut for the Jays’ wasn’t very good, but to be fair wasn’t put in the best spot having the bases loaded when he came into the ball game, Jenkins promptly gave up a grand slam to A.J Pierzynski and then another one to the next batter Will Middlebrooks to give Boston a 6-3 lead. He did give up five hits over his 2 1/3 innings while being charged for three runs, on the bright side at least he didn’t allow a walk. The Ugly Umpire Kellogg who’s strike zone was atrocious, maybe it’s time to bring Questec back. Kellogg’s performance aside, Brandon Morrow stunk today allowing a career high eight walks in 2 2/3 innings, but hey he didn’t allow a hit, that’s gotta count for something right? My biggest thing with Morrow is that he has the ability to throw mid nineties and blow guys away with his stuff but it seems like he would rather nibble at the corners and edges of the strike zone which doesn’t help his cause when he is trying to get those calls. Is it wrong that I want Morrow to challenge hitters. I agree with Gregg Zaun when he says it’s time to stop talking about potential when it comes to Morrow, the guy is 30 it’s time to show that you can pitch in the rotation, Morrow has to be the most frustrating pitcher to watch pitch out of all the guys in the rotation, today again proved that point. It has been said so far this season that the Blue Jays starting pitching needs to pitch deeper into games to help save the bullpen, and thru 19 games this season they are right. So I’ve decided to look at the numbers this season and see where the rotation ranks in terms of innings pitched and some of the interesting numbers and compare them to last season just to see where things all shake out. At the 19 game point the rotation ranks 25th in innings pitched with 103.2, they have an ERA of 3.85 while allowing 42 walks while striking out 92. The longest outing by a starter is Mark Buehrle’s 8.2 innings in his first start of the season, the Jays have only had three other occasions where a pitcher went seven innings, with R.A Dickey with one and Buehrle with the other two. The rotation has failed to go five innings on four occasions, with the shortest outing belonging to Dustin McGowan who pitched 2.2 innings in the home opener against the Yankees. At the 19 game point last season the rotation had pitched 103 innings, they had an ERA of 5.05, while allowing 37 walks and 83 strikeouts. The longest outing a starter had was seven innings and that occurred twice once by Josh Johnson and Buehrle. The rotation failed to go five innings in a game four times as well, with the shortest outing belonging to Josh Johnson who only pitched 1.1 innings in a loss in Detroit in the second week of the season. At the 19 game point this season the bullpen has pitched 64.2 innings which ranks sixth in baseball with a 3.90 ERA, however, if you take out the two blowouts from the last road trip out of the equation the pen’s ERA would be 2.73. The Bullpen has allowed 39 walks, which is the second most behind the White Sox, and have struck out 71 batters which is fifth in baseball. After 19 games last season the Bullpen had pitched 69.1 innings with a 3.37 ERA while walking 26 while striking out 57. The number of innings thrown by the rotation and the bullpen this season are similar to last season at this point. The starting pitching this season is averaging 5.2 innings pitched which if you want to compete in the American League East isn’t going to cut it. Despite the early glitches by the pen I still think they can be a strength on this team, they have to improve their command however and cut down on walks, although the same can be said for the starting rotation right now. The Blue Jays desperately need R.A Dickey to get his knuckleball figured out and they need more innings out of Brandon Morrow who has only gone beyond the fifth inning once, twice if you count the leadoff single he allowed in the sixth in Cleveland Sunday before being taken out of the game. Looking at the numbers overall highlights the need that the Jays had to sign a pitcher in the offseason to help out the rotation, and pitch deep into games right now. The Bullpen guys burned out last season and could suffer the same fate. Steve Delebar and Brett Cecil lead the pen in games pitched with nine, which over a full season works out to 77 games. Last season Cecil worked in 60 games while Delabar worked in 55 games. Aaron Loup led the team with 64 appearances and with 8 so far this season is on his way to matching or exceeding that number. The good news would be that the Jays’ have done this without the services of Casey Janssen who is on the DL with the abdominal strain, it’s safe to say that once he comes back, he will replace one of the three long men currently in the pen and add more depth to the back-end of the pen which would be an added bonus for a bullpen trying to avoid being burnt out again this season.